The Dodgers continue to punish. Last night they recorded their 15th series sweep of the season, and their first ever sweep of the Met's in franchise history. Heck, this year they haven't even been swept themselves. So, despite the numerous injuries that have hampered some of their core (Kershaw, Gonzalez, etc.) they continue to dominate like no other Dodger team ever has. This Day in Dodgers History: In 1915 rookie Dodger pitcher Ed Appleton committed an error due to a bit of trickery by Cardinals' manager Miller Huggins. While coaching on third base Huggins called for the ball from Appleton as he stepped on the mound. Appleton obliged and tossed the ball, only to see Huggins step aside and see the ball errantly roll on the field. A Cardinal runner then scored a run. In 2003 Eric Gagne tied the single season record for consecutive saves to start the season at 38. It also marked the 46th consecutive regular-season save overall. Happy Birthday, Adonis Terry, Tom Drake, Rocky Bridges, José Domínguez & Jose De Leon! Check out Dave's new digs. 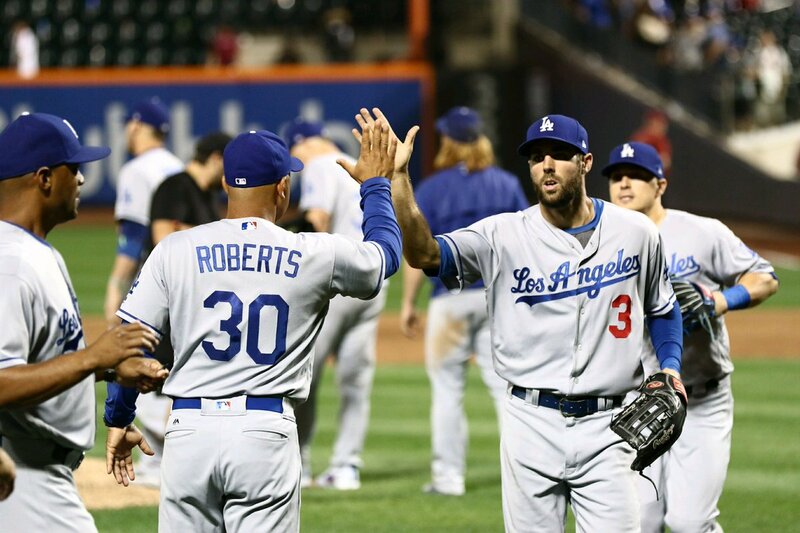 Per Lauren Beale at the LA Times; "Dodgers manager Dave Roberts picks up a new home plate in La Cañada Flintridge." As much as I hate the Giants, I wouldn't wish this on them. Per Mike Oz at Big League Stew; "Donald Trump wanted to buy the San Francisco Giants at one point, apparently." Per Michael Clair at Cut4; "Meet former Dodger Jerry Reuss, the preeminent baseball prankster of the modern era." ICYMI: Wow! Per Mike Rosenbaum at MLB.com; "Dodgers prospects go back-to-back twice in same inning: Thomas, Rincon repeat feat during Great Lakes' opening frame in homer-happy rout." 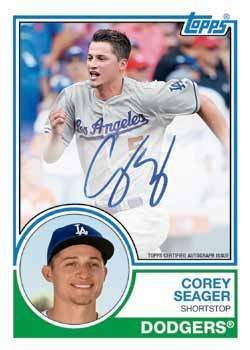 Following on the heels of the release of the design for Topps 2018 Baseball flagship Baseball, we now have preview pics of some of the other cards in the set. 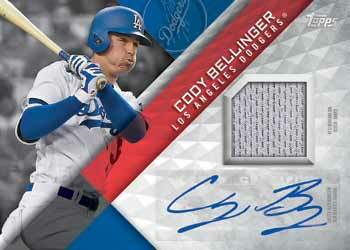 Blowout Buzz shares some of those here; including the pics of the Corey Seager and Cody Bellinger cards below. Per Ken Gurnick at MLB.com; "Maturing Puig thriving on, off field for Dodgers: Outfielder setting career highs in homers, stolen bases in best season since '14." "He's continuing to grow," Roberts said. "The Dodgers have won his heart over. He's understanding that the most important thing is to win games for the Dodgers and help the Dodgers win and it's not about him. I can say that about every one of our guys. When you come over here and make a splash, naturally, most people have a sense about themselves and a little self-promotion and get the focus on you. As he's getting older, he's learned there's a right way to do things and not the right ways of doing things."